Welcome to KC Web Design. We are an small, independant web design and hosting company based in the county of Kent, South-East of England. We specialise in designing, building and maintaining professional Wordpress websites for small businesses at affordable prices. We also offer fantastic hosting via our first-class hosting partner. If you are finding your current hosting too expensive or restrictive, consider moving your website to us and we can help you with the move. We have many years of experience in website design and are experts with the Wordpress platform. We pride ourselves on providing professional websites which are typically around 40-50% cheaper than our competitors. We offer reliable and prompt customer service which makes us first choice for so many small businesses. - Wordpress is one of the most successful CMS (Content Management Systems) available to run a website and it is free of charge. There are plenty of themes/designs (although most of these need to be purchased) and plugins to tailor your website and add functionality. As a consequence of this, it can be quite complicated to use and there are constant updates to maintain your website. Also, as it is free, it can be difficult to get help or support as you would find with a purchased product. KC Web Design has many years of experience running Wordpress websites, so rather than spend hours trying to find the right theme and getting plugins to work, ask us to maintain your website for you. We can recommend some great plugins which can improve your website and give you protection against spammers, better visibility of visitors and search engine ratings. 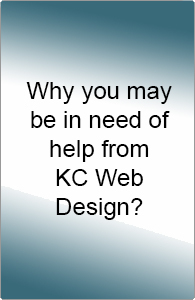 Why use KC Web Design? "Really good advice matched with rapid responses convinced us to start our online journey with KC Web Design"
We are using our website to provide information on our restaurant menu and it's helping to attract new customers . "We could not afford a website through other agencies, so this was a really good price to help get our first website." After some initial discussions via email, they produced a brillaint website for us and the whole process has been really easy." "Simple, cheap and effective hosting. We have saved a lot of money"
"Most hosting platforms are expensive or use restrictive caps which can cause problems if we grow. The hosting with KC Web Designs is so cheap and we are not limited. It's perfect for a small business like ours."